The Mother Block at my old rose nursery. Planted without bone meal. When planting roses one of the most common instructions is always to “toss a cup of bone meal in the bottom of the hole”. The reasoning behind this is that bone meal is phosphate, roses really need it and since it doesn’t travel through the soil quickly it’s best to put it in the hole. I used to do this very early in my rose days, but then stopped doing so when I started the nursery. I did a soil analysis and the results didn’t call for it. I’ve not done it since and quite frankly never noticed any difference. So I never thought about it again, and when people asked me if they should use it I simply replied by saying you can if you want to but I don’t. I figured after all, what harm can it do? 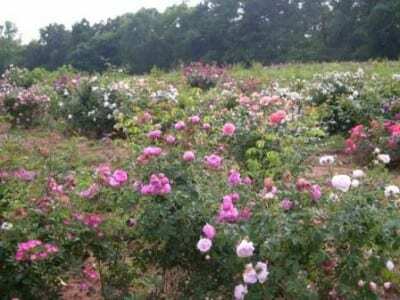 She began by noting that she could not find any scientific research saying that roses needed more phosphate than other plants. And in fact the phosphate levels of most soils are perfectly adequate for roses and all plants – something my soil analysis and observations noted all those years ago. But then the next part really made me stand up and take notice. I quote. That was an eye opener. I’ve always preached against those systemic all in one fertilizers, fungicides and insecticides because studies show the have an impact on vital soil life but this was new. Professor Chalker goes on to add. Now that last statement is great news if you own stock in a chemical fertilizer company but not good news for your roses. Those living soil organisms supply the natural nutrients that work in harmony with your roses to boost their own natural immune system. Professor Chalker is suggesting that by adding artificial fertilizers we are actually getting in the way of that process. Professor Chalker-Scott goes on to say this. One more reason to just treat roses like any other plant. After all Roses Are Plants, Too.